If you would like to find out more about any of our services, or comment on any aspect of our website, please send a message using our Contact Form. We draw on more than 40 years' qualified experience in electronic and computer engineering to bring you top-quality expertise at reasonable prices. 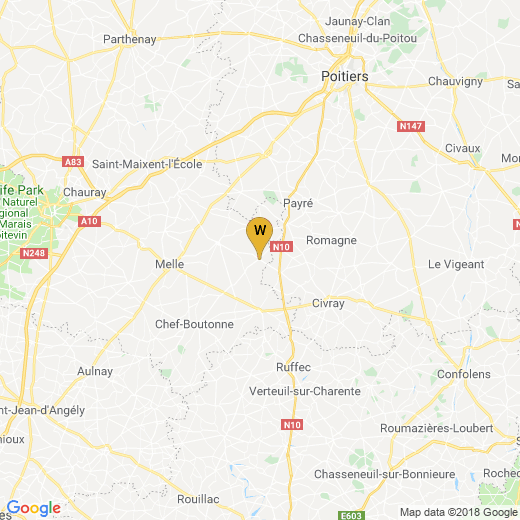 We are based in the south-east of the Deux-Sèvres and we travel to most of the Poitou-Charentes region (Deux-Sèvres (79), Vienne (86), Charente (16) and Charente-Maritime (17)). We can normally visit you with short lead times in the area shown on the map, below. Many problems can be resolved in less than two hours; if workshop attention is required, we will return your equipment without additional travel costs. Please ask for full details. Site visits may be possible further afield by prior arrangement. Technical assistance by remote methods and website services are available worldwide. You can send a message via our Contact Form and we will normally reply within one working day. We can also be reached by telephone at the number shown below. Note that you may be asked to leave a message in the event that technical staff are not immediately available. Helps the web server to know what it has already sent to your browser on your current visit to the site. It is deleted automatically when you close your browser or shut down your computer. This cookie is essential for the correct working of the contact form. See this Wikipedia article on browser cookies (opens in a new window). For our recommended products and services, be sure to have a look at the Recommendations page. Economical and effective websites for the Entreprise Individuelle or Gîte proprietor. A quality website at an affordable price, with full hosting, e-mail and maintenance service available. Ask for details, with no obligation. We pride ourselves on being able to extend the useful life of older computers. Let us assess your requirements. Our repair and upgrade service is also available for laptop machines. PC support and Web services throughout the Poitou-Charentes region of France. LastPass – "The last password you have to remember"
©2009-2019 NJWastell :: Powered by GetSimple :: Based on a design by Free CSS Templates.